From the beginning of our engagement the question from others and ourselves was “Where’s the honeymoon?” It’s definitely one of those exciting extra benefits of getting married plus I think in a way reveals a lot about the couple and their interests. Well, we have two answers. Since, September is tricky time for both of us to take off work, we are taking a few days right after the wedding and then having a big adventure in December. Immediately following the wedding weekend, Luke and I are headed off to the Dominican Republic for a few days of decompression and shear relaxation. We are staying at an incredible guesthouse in the small town of Las Terrenas (we’re taking a VERY tiny plane from Santo Domingo to get there. EEK!). The plan is basically to do as little as possible. The “main event” is a two week jaunt to Argentina and Chile! After many incarnations of our honeymoon, from a North American road trip to a return to South East Asia, we are so exciting to have decided on these locations. We will be visiting Buenos Aires, Mendoza, and Santiago. New Year’s Eve in Buenos Aires, wine tours in Mendoza, and stunning views of the Andes in Santiago. It will truly be an unforgettable dream come true getaway. Luke and I have travelled a good amount over the years and have visited beautiful and exotic locations but I know this first international adventure as husband and wife will be particularly memorable! I’m very happy to be able to say our wedding invitation are in the mail and on their way to our family and friends! It was quite the process but we absolutely love the way they came out. 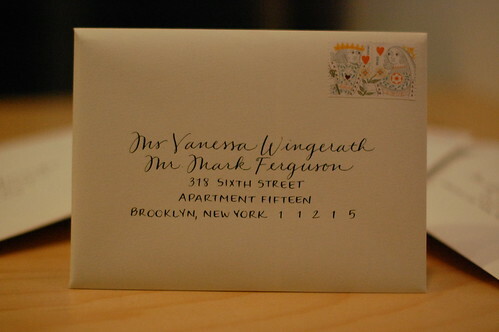 I can’t get over how beautiful the calligraphy looks… Cristine is an artist!